Suppose you have decided to get a pet fish. You go down to the pet store or fish store, and browse through all the varieties of fish. You could go with the standard goldfish, but you decide you want something a little different. 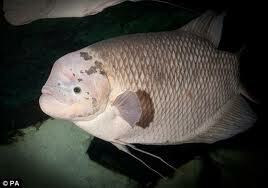 You consider some of the others, but finally stop at one that is the size of a goldfish, but has more color to it. Y ou ask the shopkeeper about it. She informs you that the fish is called a Gourami. She describes it as a tropical fish that lives only in fresh water. You like the fish and decide to buy it. The shopkeeper sets you up with the proper aquarium, filters, and all the other necessary equipment. You leave the store with the fish, and your new aquarium, excited about the new member of the family. You drive very carefully home, so as not to damage the plastic bag your new pet is traveling in. When you get home, you set up the aquarium and other equipment as you were instructed. After some temperature adjustments, you carefully put your new fish into his new home. He begins to swim around and explore his new environment. After watching him for a bit, you decide to get a snack. You go to the pantry, and find a Kit-Kat candy bar, and grab a soda . As you head back to check on the fish, you realize that you forgot to buy fish food. The store is closed now, so there is no chance of buying any tonight. What will you do? Of course! You would give the fish some of your Kit-Kat bar right? Don't be too quick to laugh at such an idea. Currently, workers at an aquarium in London are working hard to break a Gourami of its Kit-Kat habit. The fish's previous owners exclusively fed the fish Kit-Kat bars its entire life. The fish now weighs a whopping 8.8 pounds. 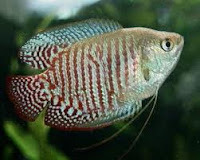 Gourami fish usually eat fruit, so they are slowly adding grapes and taking away the chocolate. The aquarium veterinarian says there seems to be no real damage to the fish's system. However, Kit-Kat candy bars are not what this fish was designed to eat. While the fish seems to be normal right now, there may be some long-term effects that may not appear for years. As humans, we might be able to exist on chocolate, pizza, and cheeseburgers. However, if that's all we get, our quality of life will be less than what we were designed for. It takes proper nutrition and exercise for us to be at our maximum capability. We might handle junk in our system for a while, but it eventually catches up with us. The same is true in our spiritual walk as well. God designed us to have a healthy dose of His Word and time with Him each day. We may be able to go for a while and seem fine. However, soon we will begin to show the outward signs of being deprived of His guidance in our lives. We begin to care more about ourselves than others. 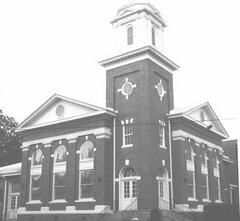 We start to miss gathering with God's people. We become more critical of those who try to do what is right. We drift a little farther away, each day we go without Him. 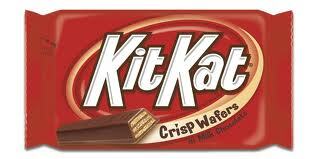 Don't try to live your life on the spiritual equivalent of Kit-Kat bars. Feast on the Word of God and spend time talking to God in prayer. It is indeed food for your soul.